Golden Apple: Starbuck is the new Typhoid Mary??? 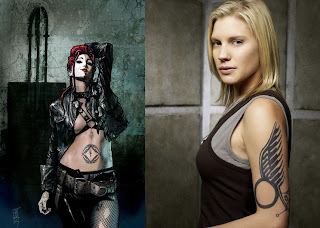 Starbuck is the new Typhoid Mary??? So if you are out there and think she would make a GREAT Typhoid Mary, then tell the peeples down at Marvel how you feel!!! Sounds like Fox is moving ahead on Daredevil restart. Good news is I hear Fox wants to make this one really dark. Cross your fingers. I added this to my Marvel Movies Group on Facebook. Mary was also a regular in earlier Deadpool comics. Since a Deadpool movie is confirmed, that's what I would think it's for... but who knows. I enjoyed the original, the only thing missing was a stronger actor for the Daredevil part. I am optimistic with regards to the reboot, and going Dark sounds like their on the right track. i think its omre deadpool then daredevil. the first movie wasn't bad at all but now that marvel is trying to make the movies into one large universe, they could easily pick up and do something with it. not make it so distant like they did with punisher war zone. Not possible to be for Deadpool or Spider-Man. This is for Daredevil. Typhoid Mary is under the character package Fox/New Regency has rights to since they used her in Elektra. well, Deadpool was in XO: Wolverine, which is a Fox film, so we can't rule out the possibility of this character appearing in a Deadpool film. This could be some fun if she is cast, whichever film it could be. Though I'm willing to bet it'd be Deadpool before they reboot DD again. Still although Fox has the rights to the name, she's appeared as Mutant Zero and they could very well go with that, or just simply have Fox distribute it again. WOULD LOVE TO SEE ANOTHER DAREDEVIL MOVIE!!! I thought the last one was prety good.. but it should have been 2 actors playing daredevil. I thought Ben Afleck did a phenominal job playing a blind matt murdock but could have been a little better playing the actual daredevi character. Am I the only one that thinks you guys invaded Sackoff's privacy by reporting her (possibly personal) purchases to the public like some bottom-feeding paparazzi? Yeah, nice call on not respecting the privacy of your customers. Remind me never to shop at Golden Apple! For crying out loud, it's not like she was a patient at a hospital! She was in a PUBLIC venue and informed the owners HERSELF she wanted a part in a Marvel movie. There isn't any invasion of privacy here! Reginald Hudlin Does A Signing Here!!!! The Golden Apple has 2 great Southern California locations, one in the middle of LA on Melrose Ave and in the San Fernando Valley near the CSUN campus.